It is my great privilege to be invited to write the devotional matieral for America World (AWAA) to kick off their Season of Hope this year. 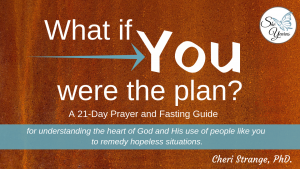 It’s a 21-Day Prayer and Fasting Guide written with you in mind. It doesn’t matter if you have adopted, thought about adoption, or have never even contemplated it before reading this sentence. Adoption is not all they do and it’s not the focus of the 21-days. Instead, the days walk through Hebrews 11 and how God might want to use everyday people to remedy a host of dire situations around the globe. One of those desperate situations happens to be the orphan crisis and this group is working in countries around the world with orphan care, as well as through international adoptions to meet the needs of the needy. The bottom line is that we all have a part to play. We ARE the plan God has chosen for bringing hope into seemingly hopeless situations. This guide is a tool to help draw us toward the Lord to focus on what He might have for us in the here and now that may have eternal significance. I hope you will come along! You can find this 21-day plan on YouVersion at this link. Allow me to invite you to check out America World Adoption. The work God has called them to needs our prayers. How can you and I pray? Check out this link where you and I can find specific requests to pray over right now and for the next 21-days. AWAA is an organization near and dear to our hearts as they are the entity we went through to adopt six of our children. I can’t say enough good things about them as whole or the people there. We completed three different adoptions through AWAA, working with different people every time and had great experiences. These days they do a lot more for so many. It’s well worth checking out. There is a place for you to be involved. Praying you will know and understand all God has for you. Where can we do to make significant changes in our lives that will be lasting and significant? In this episode of the She Yearns Podcast, Five Life Changing Resolutions , Cheri leads the listener through five examples in Scripture in which resolutions either impacted a situation or a person dramatically that can be emulated today. You won’t want to miss it! You can now check out Five Life Changing Resolutions from iTunes, GooglePlay, Stitcher, or SoundCloud. Just click on the links below! As always, you can scroll down and listen right here! Looking to start the year fresh? New Goals? Get back on track? Then you need to a plan! In this episode of the She Yearns Podcast, Planning to Succeed, Cheri Strange looks at what Jesus offers in Mark 2 that will set you on a plan to succeed, in His eyes, in the next season of life. You can now check out Planning to Succeed from iTunes, GooglePlay, Stitcher, or SoundCloud. Just click on the links below! As always, you can scroll down and listen right here!